This past winter’s minimal rainfall of only 3.5 inches is a great reminder that water rates will continue to rise as the availability decrease with high demands. So, if you haven’t made significant changes to your landscape, those water bills or a brown lawn will haunt you for the foreseeable future. It seems it was only a year ago that we had water restrictions, mandating which days we could water. Neighbors were “on patrol” looking for those culprits whose water would run down the street and call the city. While these reminders may still be fresh, imagine how this next drought will affect all of those who have thirsty landscapes in the future. 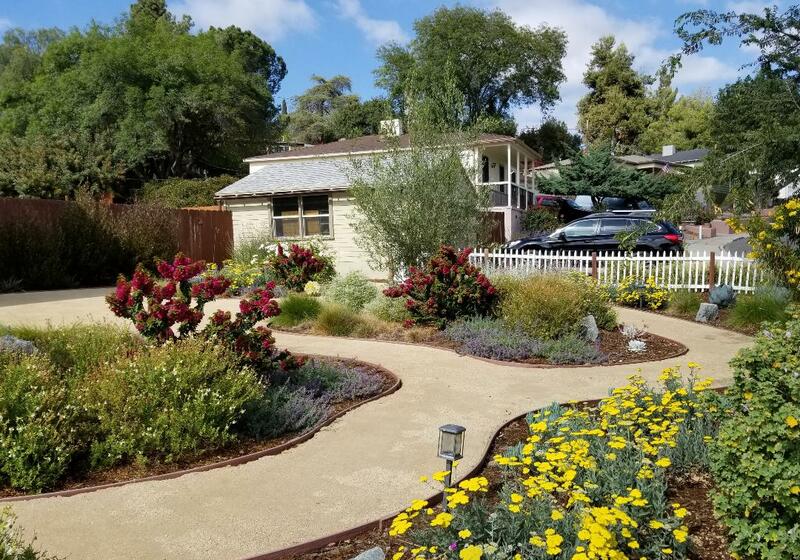 So with this recent lack of rainfall once again, Water wise landscaping in San Diego is timely. There is still one water rebate program, Sustainable Landscape Incentive Program which offers $1.75 per square foot of turf removal. The program offers a rebate on 500 to 3,000 square feet of living or dead turf. 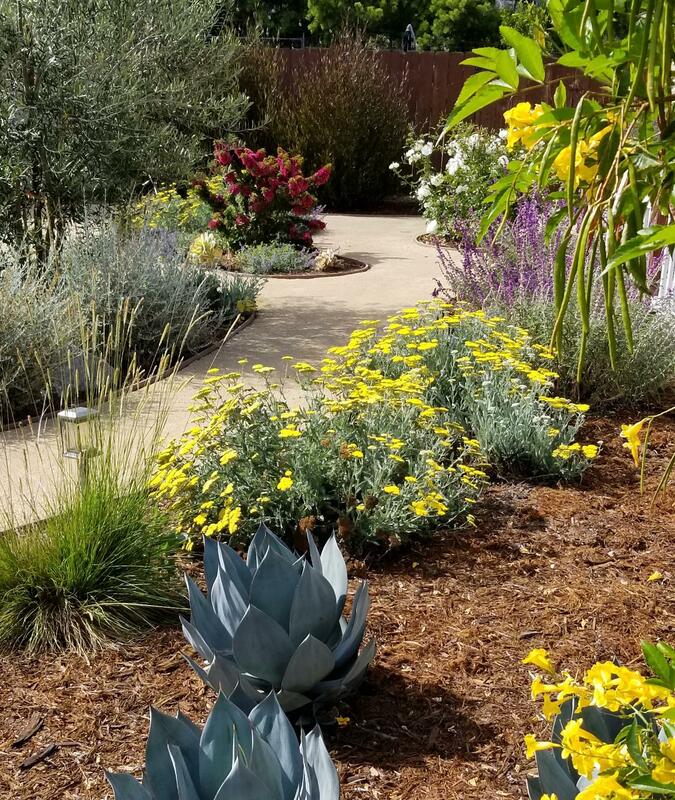 Key elements of this program mandate rainwater capture, climate appropriate plant selection and permeable hardscapes in addition to high efficiency irrigation. This program is quite a bit more involved than the previous lawn rebates a few years back. But even if you don’t qualify or don’t want to jump through so many hoops, Water saving landscaping doesn’t have to be so challenging if you take the time to educate yourself and or work with a professional to guide you. Let’s face it, who has time to earn another 4 year degree in Horticulture or Landscape Architecture? I want to use a recent project as an example of a successful drought tolerant landscape. In this scenario a young couple purchased a home on a fairly large tract of land in an older neighborhood. They had removed the lawn and rototilled to improve the soil structure. Once they had killed off the stubborn Bermuda grass, they realized they needed a design and professional advice on how best to implement a new landscape. Their yard was primarily in the front and side of the house with a significant exposure to the streets as they were situated on a corner lot. They opted to have no lawn area, but needed a larger area to add raised beds for vegetables at a later date. So they needed pathways to wander through the garden, access to the garage, and the future beds all while at the disadvantage of so much exposure from neighbors. One of the first things they did once a design was drafted was to add trees such as Olive, Live Oak and Chinese Elm. Trees have such a major impact on a landscape, and they take the longest to grow and mature. Once trees do mature, they offer tremendous value to any property with the benefit of shade, moisture retention and attracting wild life. Other “climate appropriate” plant material included a variety of ornamental grasses and a few different types of agaves. Adding plants for color, we used Salvias, Catmint, Bougainvillea, Yarrow and Kangaroo Paws. 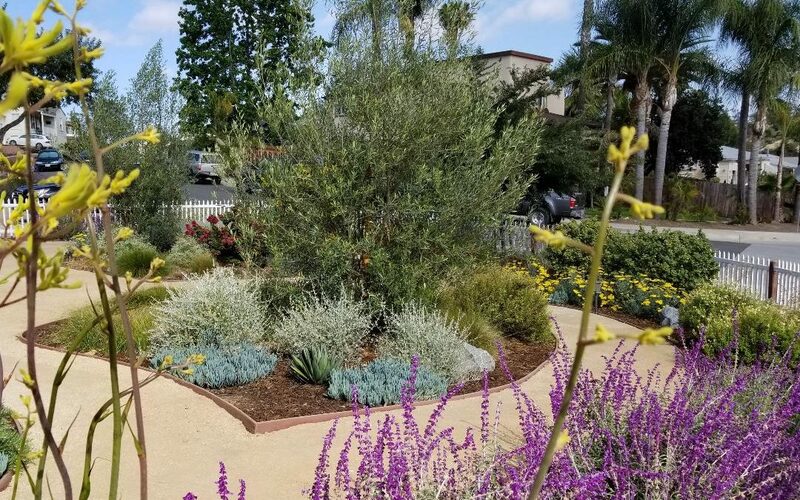 And a few other aspects to note with Water wise landscaping in San Diego are the details of adding a 3 inch layer of bark mulch around all the new plantings. Be careful not to place the mulch right up against the plant itself, it needs some room to breathe. And also a part of the sustainable rebate program as mentioned above is the need to create “living soil”, add compost to the native soil. Add 1/3 compost to 2/3s existing soil when adding soil around your new plants. Compost will allow for more water retention as it loosens the soil. As you’ll discover our native soils are mainly clay. Gypsum also helps to break down clay and Kellogg’s Amend is another good product to assist with heavy clay. And of course irrigation is another major consideration with Water wise landscaping in San Diego. Drip, micro-spray or sub-surface irrigation, such as “netafim” is the only way to go. So despite our warming temperatures and limited rainfall, you can have a beautiful garden to add value to your home and greater enjoyment of your outdoor spaces. Contact Letz Design Landscape for a free consultation today, or call 619-265-1906.